For the beginner or the newcomer! 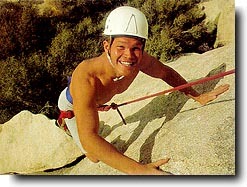 Many people think that rock climbing is an upper body type sport. The fact is rock climbing primarily uses legs, precise footwork and balance. If you've an abilty to walk, respect heights and a desire to try rock climbing, you have met the prerequisite. Our clients have ranged from four to eighty four years of age. Nearly half of our clientle are women climbers that tend to excell at the art of climbing. This one day rock climbing curriculum begins with "Bouldering" where we climb low to the ground, implementing spotting, precision footwork, body positioning, balance, awareness and use of rock features (hand holds and foot holds), energy conservation techniques and choreographing individual moves. This confidence building exercise in footwork, balance and trust are key to your individual progress and enjoyment. Next, explanations of climbing gear and its use. 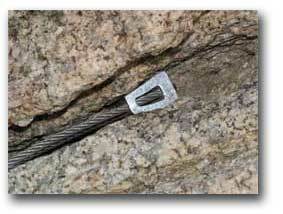 Tying the figure 8 knot, belaying (a climber's safeguard) and communication signals . 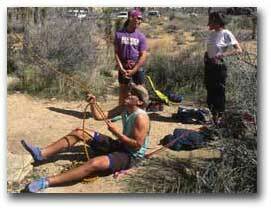 You will practice your belaying/ lowering and climbing on top-rope protected climbs. This means you will be climbing on real rock outside. Learning to rock climb in a place with incredible natural beauty make for an unforgettable quality experience. Combine the Basic Rock Climbing I with our Basic Rock Climbing 2 for our most popular class, Basic Rock Climbing Weekend. Cost: $195 To make your reservation, Click Here! complete and submit. You will receive a confirmation by Email within 48 hours. Remember to bring your lunch, snacks, plenty of water, clothing layers appropriate for time of year, hat, cap, sunglasses, sunscreen, personal items, (optional) camera for the memories and a daypack. Dates are "Basic Rock Climbing Instruction I" classes offered on selected Saturdays.